created and installed, 1990, by Ancient Arts. Way back in 1990 an unexpected visitor arrived at Ancient Arts Stained Glass studio (http://www.ancientartsstainedglass.com) in San Pedro, California. It was Sala, the High Talking Chief of Fagasa Village, American Samoa. Sala's village was building a new church, a church that was to be, at that time, the largest church in American Samoa. Included in the plans were three stained glass windows, the largest of which is 8' x 14'. Sala showed Ancient Arts Stained Glass owner Mark Schoem a rendering which had been prepared by the church architect. The central image was the Crucifixion. The decorative border and base had a traditional tapa design used in traditional Samoan art forms and fabrics. Ancient Arts Stained Glass Studio was hired for the project and later in the year we crated and shipped the panels and flew to Pago Pago for the installation at the Congregational Christian Church - American Samoa in Fagasa. Never to be forgotten was the sight of the full moon over Pago Pago Harbor, one of the largest and most beautiful natural harbors in the world, as our plane approached for landing at Pago Pago International Airport. 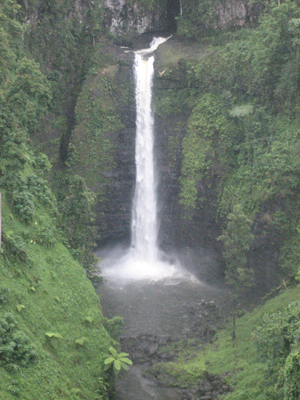 During the week of our stay we saw many other beautiful scenes of natural beauty. Even more impressive was the kindness, friendliness and generosity of the people. It was a great experience to get a taste of Polynesian culture. We returned in 1991 for the church dedication. 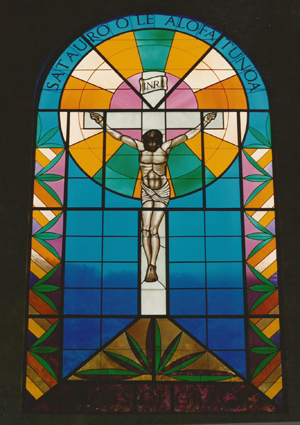 Then after the punishing destruction of Cyclone Val, we created a replacement Crucifixion window in 1992 which was installed in a stronger double frame with protective Lexan on the outside. Two ideas lingered with me after my experience of 1990-1992. First, that someday I would like to show this beautiful country to my wife. Second, the people of American Samoa, when hearing my appreciation of their country, always said to me, "Yes, American Samoa is nice and it is beautiful, but Western Samoa (now known as Samoa) is even more beautiful." photos left to right: The headstone of Sala Samiu who died in 2003, before we had a chance to visit again; Sala Samiu, High Talking Chief, Fagasa Village, American Samoa and Ancient Arts owner Mark Schoem after the stained glass installation in 1990. When we arrived in American Samoa in July, 2013 we stayed at the Tradewinds Hotel. While having breakfast the first morning in the hotel restaurant, the Equator Room ("where North meets South"), we were given permission by a special security detail to introduce ourselves to some very special hotel guests who were also having their breakfast. These guests were the Head of State of Samoa (independent Samoa), His Highness Tui Atua Tupua Tamasese and his wife Filia. Surprisingly, Filia told us that they were concluding a visit to Fagasa Village where the Head of State gave an address to honor his close relative, Jerry Atuatasi, who was one of the high chiefs of Fagasa Village. Filia told us how much she admired the beautiful stained glass window in the front of the church. Imagine her surprise when we explained that I had created that window! 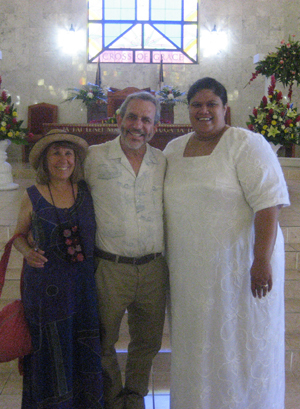 We had a nice visit with Filia the following week when we were touring Samoa. When we attended the church services in Fagasa Village, the minister graciously pointed out Esther and me to the congregation. Afterwards, Sala's daughter Aiga, her husband Simi, the Minister and his family and their friend Sia took Esther and me to lunch at a beautiful seaside restaurant. Before we left American Samoa we had a reunion with Reverend Aneteria Misioka and his wife Tavai. Reverend Misioka had the pulpit in Fagasa for many years. 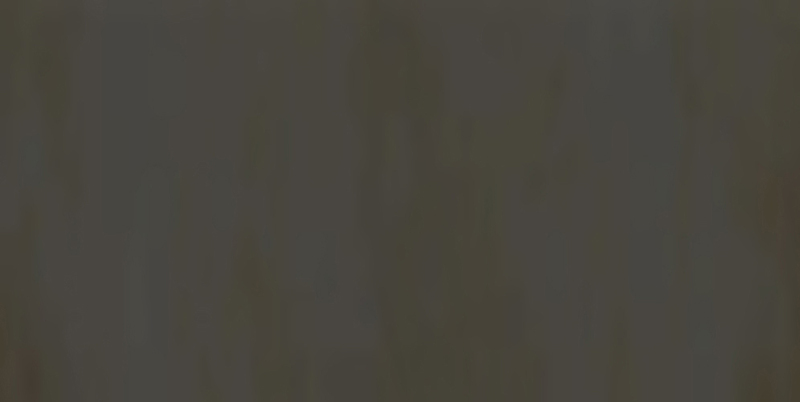 He is now continuing his work in Amanave. It was great to return to American Samoa and Samoa was as lovely as predicted.